Historic dockyards, royal visits, hundreds of sailors, big-budget film shoots, and even a laser quest; it can only be Her Majesty’s Naval Base (HMNB) in Portsmouth. 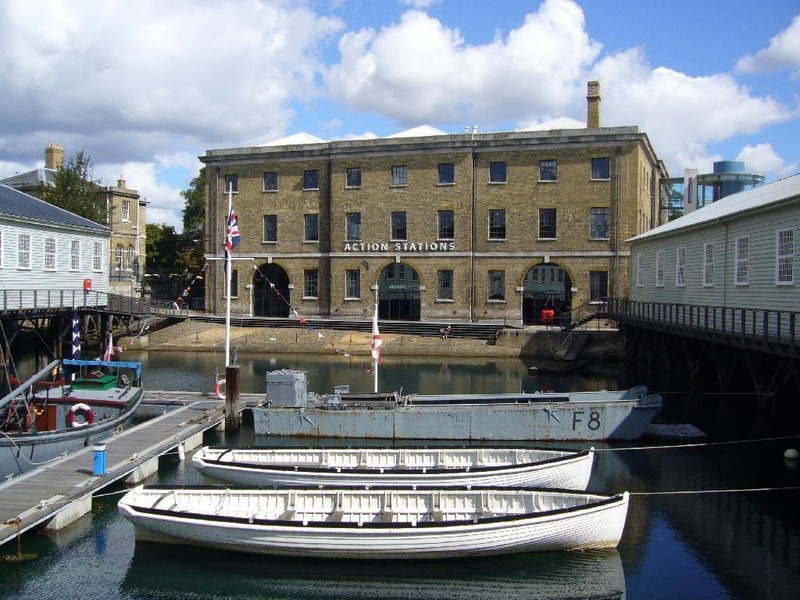 It’s the oldest base in the Royal Navy, with the first dock built back in 1194. A lot has happened here in more than 800 years: Ships from the base fended off the Spanish Armada in 1588; Horatio Nelson embarked from the base towards the Battle of Trafalgar in 1805; the 27,500-ton WW1 battleship Royal Sovereign was launched in 1915; the Oscar-winning film Les Misérables was filmed here in 2012; and it’s now where tourists from far and wide come to see HMS Warrior 1860, Mary Rose, HMS Victory and more. This is also the base of search and digital marketing agency Vertical Leap. The mix of modern marketing and historic heroism doesn’t seem weird to us. While many newer digital agencies either work from home or have an open-plan office wedged in a forgettable office block (complete with beanbags, flat screens and games consoles), here at Vertical Leap we have something even cooler – military heritage. 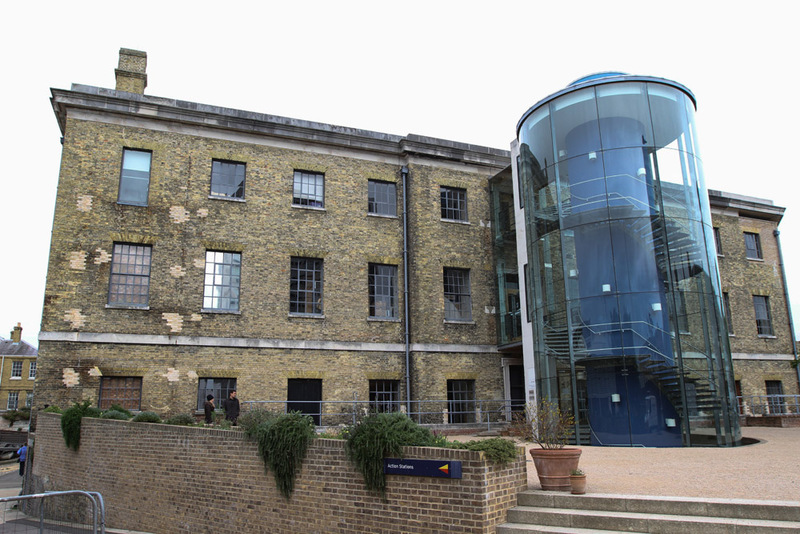 Sure – we have a couple of beanbags, flat screens and game consoles scattered around too; but when we look out the windows of our Portsmouth headquarters we’re constantly reminded of the history and innovation surrounding us. On one side, we can see the Spinnaker Tower; the centrepiece of Portsmouth Harbour’s redevelopment over the past ten years. 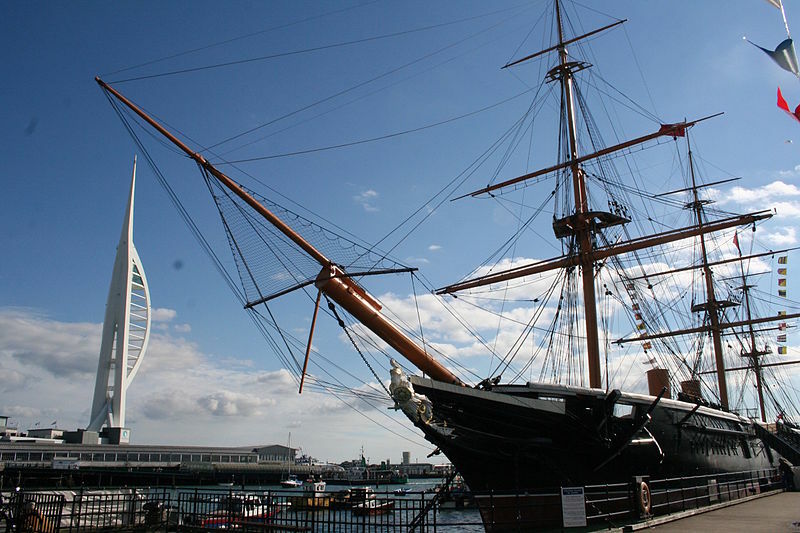 On the other, we can see the HMS Warrior, a 155-year-old armour-plated warship spanning 420ft of the harbour. 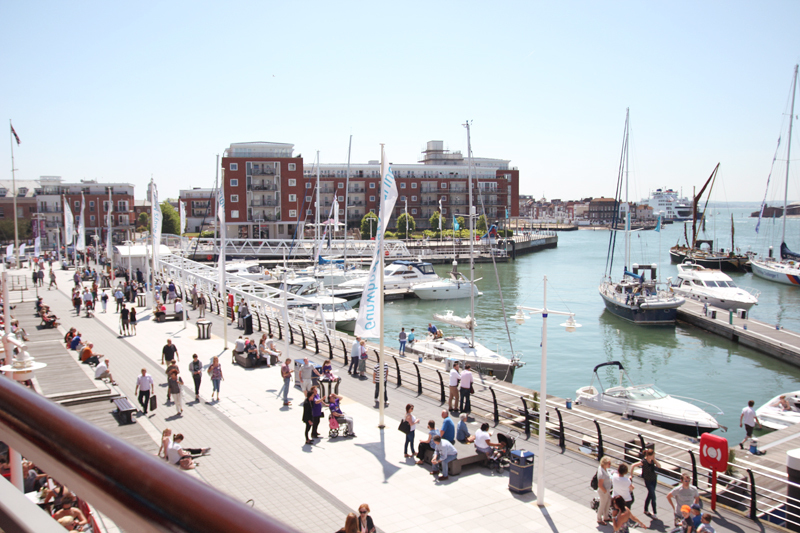 The impressive Gunwharf Quays shopping centre is five minutes away, full of excellent restaurants and bars. The mix of new and old is fitting. Vertical Leap is a search marketing agency steeped in heritage, founded back in 2001. Our founder and managing director Matt Hopkins moved to Portsmouth from Texas and fell in love with the Hampshire area. When thinking of possible locations his new Portsmouth SEO agency could call home, there was only ever one place on his mind – the dockyard. What’s it like to work in Portsmouth Historic Dockyard? 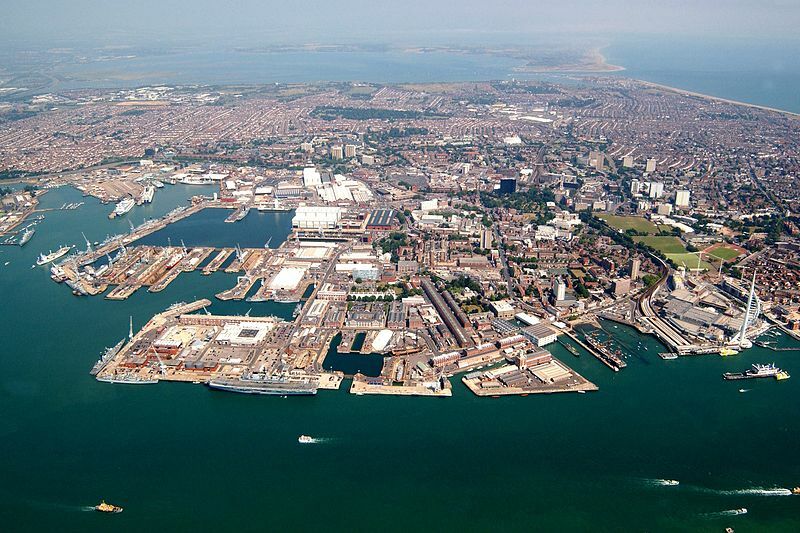 The entire Naval Base, including Portsmouth’s Historic Dockyard, spans a staggering 50 square miles (130 km²). It’s essentially a city within a city, and the working place of thousands of people. The thing is most people will never know what it’s like behind the large walls, beyond the tourism areas – even people living in Portsmouth. For the vast majority of the base you’ll need a Naval Base pass just to get through security, and getting a pass is quite the endeavour. Luckily, our office is located in the part of the Dockyard that’s open to visitors. It’s not hard to see why people flock here; even when you’ve worked here for a while, you still have new experiences. Clients are always amazed at quite how big the Naval Base is when they visit our office. In fact, they’re often amazed at how big Vertical Leap is too. We also have an office in London –keeping us in the thick of it, and providing a perfect middle ground for far away clients. But while the company will continue to grow in size, Her Majesty’s Naval Base in Portsmouth will always be Vertical Leap’s headquarters. What can you expect from a visit to the dockyard and Vertical Leap? There’s rarely a dull moment in the Historic Dockyard; from summer music festivals to Christmas markets and fayres, foreign tourists here to see the boats to the local families enjoying a relaxing day out. When you enter the Portsmouth Historic Dockyard (actually, even before you enter), you’ll instantly spot HMS Warrior 1860. Continue down past the enormous Boathouse 4 and you’ll find the National Museum of the Royal Navy, the HMS M.33, HMS Victory and the Mary Rose. The Vertical Leap office is located to the right over in Boathouse 6 – above the £16 million visitor attraction Action Stations. Below us are families taking boats for a spin around the Mast Pond, excited young’uns playing laser quest, and thrill-seekers ascending the tallest indoor climbing tower in the UK. There’s also a fantastic cinema on-site. Visitors can also enjoy harbour tours and a walk through the Historic Boat Workshop, in which they’ll find a unique collection of historic small boats, from whalers to sailing dinghies. We’ve even had movie stars and film crews here at HMNB; Hugh Jackman and Russell Crowe came to the dockyard back in 2012 to film Les Misérables, which was nominated for Best Picture, Best Actor, Best Supporting Actress (Anne Hathaway won), Best Production Design and more at the 2013 Academy Awards. Have a peek at the film’s shoot in Portsmouth below. Of course, the vast majority of our time is spent in front of our computers, devising marketing campaigns for our clients. When clients visit us, they won’t find our specialists working in silence or solitude. That doesn’t mean we’re not working hard though, as Dave explains. “I like being able to hear everything that’s going on, and the fact that the teams aren’t separated. This means I can get opinions and help whenever I need it; it’s easy to bounce around ideas or ask a colleague to take a look at something. Then again, sometimes the perks of working in the dockyard come outside of work. “When I watch the BBC spy drama Spooks and it gets to a really dramatic bit where a member of the public has to sign the Official Secrets Act, I get to proclaim loudly (and proudly) to my fellow watchers that I have already signed it,” says Coralie. I asked the Vertical Leap team for some of their favourite memories from our time working in the Portsmouth Historic Dockyard. Here are just a few of them. Why don’t you come and visit Vertical Leap in the Portsmouth Historic Dockyard within Her Majesty’s Naval Base? We’ll make a day of it. Give us a ring on 0845 123 2753 or fill out this quick form. Or if you think this sounds like the kind of place you’d like to work, check out our current vacancies.